Autumn Fantasy is a jewel of a screensaver and a feast for your eyes. 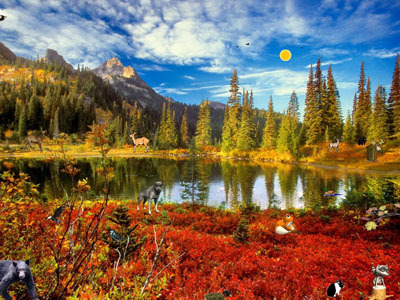 It lets you unwind to the magic of autumn coming up to life on the desktop as a string of beautiful forest views. You`ll immerse into the quiet of the season with the trees standing yellow, red and orange, leaves rustling under your feet, chilly air and the rippling water of the river that reflects all this beauty with different shades of color. Free screen saver with 12 scenic photos, Christian Scriptures, transitions and midi music.